Background: Avulsion fractures of the tibial attachment of the posterior cruciate ligament have been repaired using open reduction and rivet fixation, hollow screw fixation, or arthroscopic reconstruction of the posterior cruciate ligament. These methods ignore the importance of early tension reconstruction of the posterior cruciate ligament, so their efficacies are uncertain. Determining the optimal fixation method and how best to restore knee stability remain controversial. Methods/Design: We will conduct a prospective, single-center, self-controlled, clinical trial at the Cangzhou Central Hospital, Hebei Province, China. Fracture fragments and the injured posterior cruciate ligament will be exposed in twenty patients with avulsion fracture of the tibial attachment of the posterior cruciate ligament through a posterior approach and open reduction. The posterior cruciate ligament will be reconstructed with a new type of bone plate. All patients will be followed for 3 and 12 months. 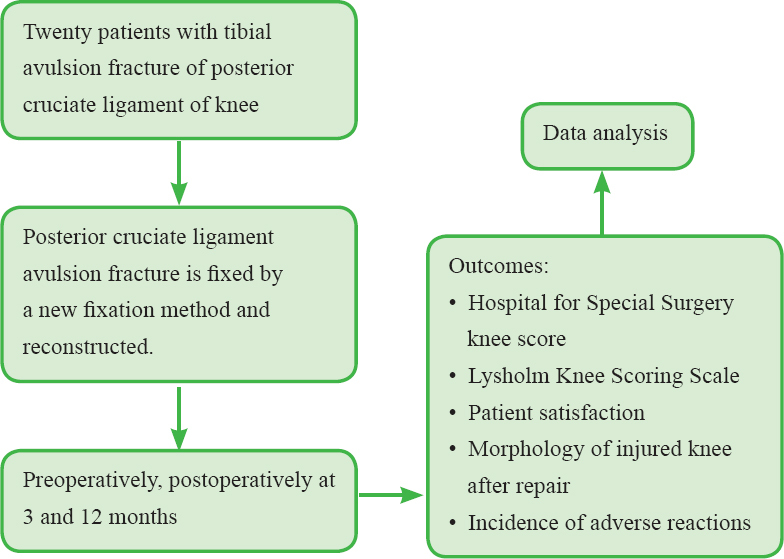 Primary outcome: The Hospital for Special Surgery knee score will be used to evaluate knee function preoperatively and 3 and 12 months postoperatively. Secondary outcomes: Lysholm Knee Scoring Scale, X-ray, computed tomography, and magnetic resonance imaging will be used to assess knee morphology preoperatively and 3 and 12 months postoperatively. Patient satisfaction will also be assessed at 3 and 12 months postoperatively. Discussion: This trial will evaluate a newly-designed plate fixation device for early tension reconstruction of the posterior cruciate ligament to repair avulsion fractures of the tibial attachment of the posterior cruciate ligament and restore knee stability. 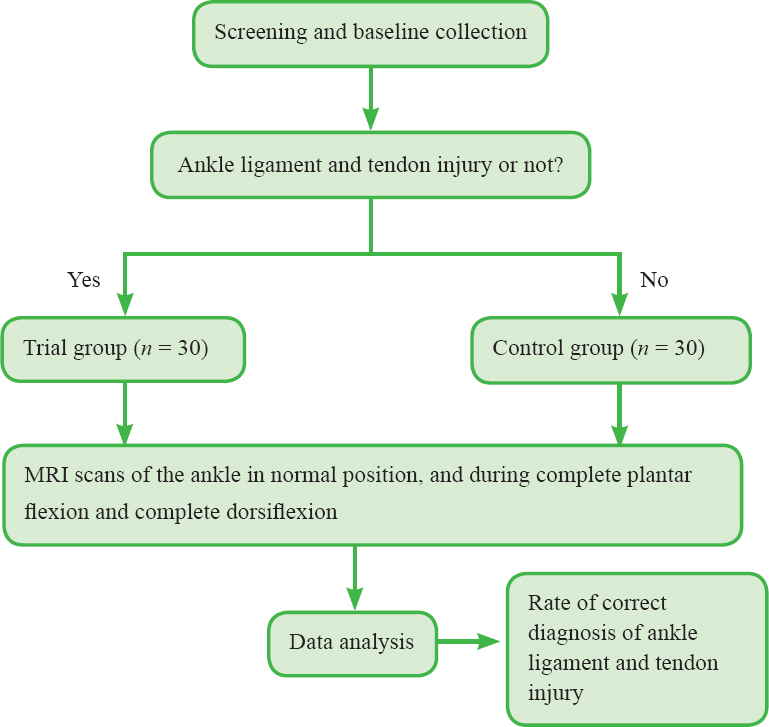 This trial will verify the plate's efficacy, provide an experimental basis for treating avulsion fractures of the tibial attachment of the posterior cruciate ligament, and provide a method of maximizing knee stability. Trial registration: ClinicalTrials.gov identifier: NCT03059368. Ethics: The study protocol has been approved by the Ethics Committee of Cangzhou Central Hospital of China. All protocols will be in accordance with Helsinki Declaration, formulated by the World Medical Association. Informed consent: Written informed consent will be provided by participants. Background: Total hip replacement with a collum femoris preserving (CFP) short stem prosthesis can reportedly reduce postoperative complications and preserve maximum bone tissue for long-term revision. However, CFP replacement has a relatively high risk of intraoperative periprosthetic fractures that can seriously harm hip function recovery. Therefore, this study aims to analyze risk factors for periprosthetic fractures and develop preventive measures to reduce postoperative complications. 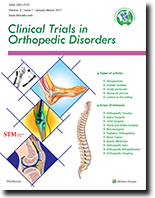 Methods/Design: A prospective, single-center, self-controlled, open-label study with 2-year follow-up will be carried out at the Department of Orthopedics, Third Hospital of Hebei Medical University, Shijiazhuang, Hebei Province, China. We will analyze data from 25 patients who undergo total hip replacement with the CFP prosthesis. Primary outcome measure is Harris hip score preoperatively and 6, 12, and 24 months postoperatively. Secondary outcome measures include fracture severity as assessed by periprosthetic fracture classification according to the American Academy of Orthopaedic Surgeons guidelines, and bone healing as assessed by CT and radiographic findings preoperatively and 6, 12, and 24 months postoperatively, including parameters of the proximal and mesal medullary cavity of the fractured femur (width of the medullary cavity at the point 20 mm above the midpoint of the small trochanter, at the midpoint of the small trochanter, at the point 20 mm below the midpoint of the small trochanter, and at the fracture line; width of the corresponding prostheses), intertrochanteric width, femoral neck-stem angle, femoral neck anteversion, femoral neck length, ratio of the distal end of the prosthesis to the medullary space, and height of the femoral calcar. Other outcome measures are multiple logistic regression analysis results of risk factors for periprosthetic fracture during hip replacement, and the incidence of adverse events within 24 months postoperatively. Discussion: This study will be expected to provide references for reducing the incidence of periprosthetic fracture during hip replacement with the CFP prosthesis. Trial registration: ClinicalTrials.gov identifier: NCT02981823. Ethics: Approved by the Ethics Committee of the Third Hospital of Hebei Medical University, China (approval number: KE2016-011-1), the study protocol will be performed in accordance with the guidelines of the Declaration of Helsinki, formulated by the World Medical Association. Informed consent: Written informed consent will be obtained from all participants prior to the trial. Background: The etiology of degenerative disc disease (DDD) is complex and includes genetic, gender, age, environment and traumatic factors. Obvious relatedness of DDD patients has been documented. Genetic factors account for 75% of the risk of DDD and although many genes have been associated with DDD, no specific marker genes have been found. Therefore, we will establish a biological sample library and database of DDD patients who have a family history of the disease and who require surgical treatment. To identify pathogenic DDD genes, we will screen the patient database for genes that contain polymorphisms and/or are differentially expressed. Methods/Design: This is a single-center, case-control study, which will be performed in Shanghai First People's Hospital, School of Medicine, Shanghai Jiao Tong University, China. A total of 2,000 subjects will be prospectively collected from the wards and clinics of Shanghai First People's Hospital. These patients will consist of 1,000 DDD patients with a family history, 500 DDD patients without a family history, and 500 normal controls. Blood or intervertebral disc tissue samples will be collected. Total RNA will be sequenced to identify differentially expressed genes. Genome-wide association analysis will be performed using high-throughput microarrays and single nucleotide polymorphism microarrays and pooling (SNP-MAP). The primary outcome measure of this study will be the percentage of differentially expressed genes in DDD patients with or without a family history. The secondary outcome measures will be sequence variation in differentially expressed genes, SNP genotyping, routine liver and kidney function tests, routine blood tests, routine urine tests, and morphology of degenerated spinal discs. Discussion: This study aims to identify the pathological and physiological risk factors of DDD from the perspective of genetics by screening for genes that are differentially expressed in DDD and to correlate them with DDD, and to identify precise molecular targets for drug development and diagnostics. Trial registration: The study protocol was registered in Chinese Clinical Trial Registry (registration number: ChiCTR-COC-16009617) on October 10 th , 2016. Ethics: This study has been approved by Scientific Research Project Ethics Committee, Shanghai First People's Hospital, China (approval number: 2016KY166-2) and will be performed in strict accordance with the Declaration of Helsinki formulated by the World Medical Association. Informed consent: Written informed consent regarding study protocol and treatment procedure will be obtained prior to involvement in the clinical trial.